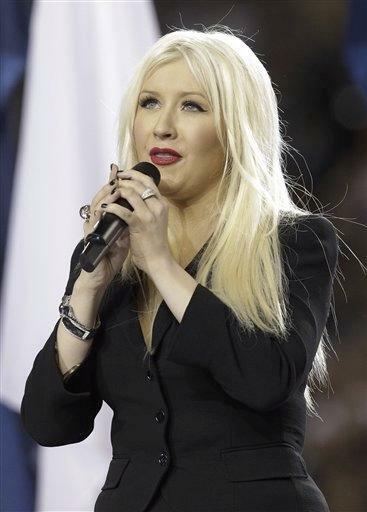 ARLINGTON, Texas (AP) - Christina Aguilera says she flubbed a line as she belted out the national anthem at the start of the Super Bowl on Sunday night after getting lost in the moment and losing her place. "I can only hope that everyone could feel my love for this country and that the true spirit of its anthem still came through," she said in a statement after the performance. When she was supposed to sing the line "O'er the ramparts we watched, were so gallantly streaming," she instead repeated an earlier line, with a slight variation. The mistake immediately set social networks abuzz with people commenting on the error. She's not the first person to mess up the lines of "The Star-Spangled Banner." In 2001, Macy Gray was famously booed for her off-kilter rendition of the national anthem. She garbled the words at the Pro Football Hall of Fame exhibition game in Canton, Ohio, her home state. She later told The Associated Press: "That was definitely life's most embarrassing moment." And in December in Kansas City before a game between the Chiefs and the Denver Broncos, Mike Eli of the Eli Young Band flubbed up the lines of the song so badly that he had to start over. Aguilera, who took the stage in a black dress, was returning to the Super Bowl after being one of the performers during the halftime show in Atlanta in 2000. After it was announced that Aguilera would be singing the national anthem for the 2011 Super Bowl, she said in a news release that she had been performing the song since she was 7 and was "excited to be part of such an iconic event."